You will earn 7,325 Reward Points. Earn 1 reward point for every 1 dollar spent. All of the convenience of VolPak condiment dispensing without the hassle of CO2 tanks and pumps. Stainless steel interior and exterior is easy to clean and sanitize. Pumps can be easily cleaned in place - no disassembly required. Easy to maneuver with four tough-duty 5” (127 mm) swivel casters, two with brake. System handles various thicknesses of condiments, including available salsas and relishes. Durable, easy to use dispensers are within reach for teens and adults. Dispensers can be mounted in any direction. Safe and sanitary method of dispensing. Sealed, sanitary pouches are vacuum sealed. Pouches are easier and safer to handle than cans. Reduced risk of bacterial contamination and customer intervention. Utilizes convenient, economical disposable 3-gallon condiment pouches. Decreases food costs up to 30%. Eliminates theft and waste up to 30%. Reduces labor to refill and clean pumps and containers by as much as 75%. Color coded and/or etched knobs for pumps. Group 2 or custom laminate finishes over stainless steel exterior. 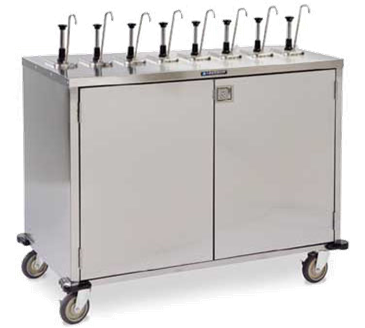 Cart shall feature a closed, sealed, sanitary dispensing system for utilizing economical 3-gallon bulk packed condiment product, and shall not require refrigeration or electrical power. Unit shall be of welded stainless steel construction. Dispensing system shall include 4, 6, 8 or 12 free flow manual dispenser pumps with flexible plastic supply hoses, and shall include 2, 3 or 4 polyethylene bins for storage of condiment product pouches. Supply hoses shall feature universal VolPak snap-on connectors to fit all brands of condiment products, and shall connect to pumps with convenient hand key screw clamps. Pumps shall be able to be cleaned in place or to be easily disassembled for cleaning. Hinged doors shall be double-pan construction with locking paddle latch. Standard interior and exterior finish shall be stainless steel for easy cleaning and sanitation. Cart shall have 4 each, 5” swivel Lake-Glide® casters, 2 ea. with brake.